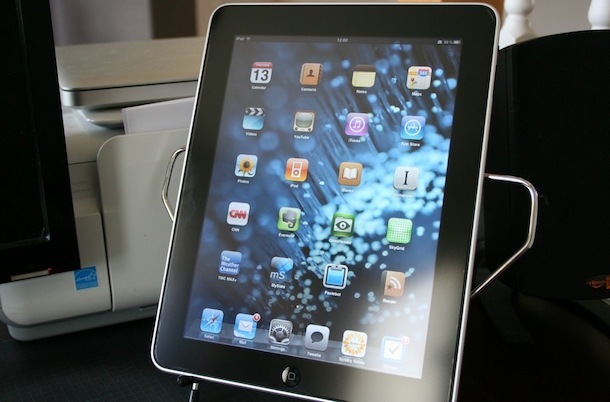 The iPad has a beautiful screen, there’s no doubt about it. What’s not so beautiful is the glare that you get with a glass screen, I can deal with the glare indoors in most situations but when working with an iPad outdoors it’s pretty difficult to maneuver in such a way that the glare isn’t distracting. Sure, you can pump up the brightness on the screen and that helps a bit, but I went looking for a better solution in the form of a screen cover that will reduce glare and also help get rid of the finger prints. There are two iPad screen protectors with anti-glare properties that I’m going to recommend. 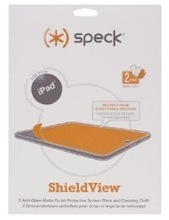 The Speck iPad ShieldView Anti-Glare Protective Screen Film is the one that I’m most satisfied with for glare reduction. I first saw this on someone elses iPad and was really pleased with the anti-glare properties so I chose one myself. It’s not perfect, but it really cuts down dramatically on the intense mirror-like glare of bright light sources, and instead casts a more subtle diffused reflection. The best part about the Speck Shield is that not only does it protect the screen from scratches but it’s anti-glare coating really helps reduce the glare on the iPad’s glass screen, so you get more bang for your buck. You can buy the Speck Anti-glare protector on Amazon for about $18 which is a pretty good deal since it’s about $6 cheaper than retail. In my opinion this is the best iPad anti-glare screen protector. While I’m a fan of the Speck Shield, a friend of mine has the ScreenGuardz Anti-Glare Screen Protector on his iPad and he’s really happy with it. If I didn’t go with Speck Shield I would go with the ScreenGuardz model, the performance is similar but to me looks slightly different. Again, it doesn’t 100% remove glare it just reduces and distributes the screen glare better so your iPad doesn’t look like a mirror anymore. At the moment you can get the ScreenGuardz Anti-Glare Screen Protector on Amazon for around $12 which is a steal. My advice: find a tidy dust-free location to perform the install. Clean the screen very well before attempting installation and follow the directions carefully, and most importantly; take your time. If your rush the process, you are likely to have a poor install and then not be pleased with the results. Have some patience and go slowly and you’ll be able to get a completely dust and bubble-free smooth install. If you’ve ever put one of the Zagg screen protectors on an iPhone it’s practically identical except the surface of the iPad is larger so you have to be a bit more careful. Yes being self installed means there is a potential for error. You should definitely be aware that installing the iPad Anti-Glare covers can be a bit of a pain, in fact most of the negative reviews you’ll hear about them are regarding the installation process and the potential for little screen bubbles or dust trapped underneath the protective film. I don’t think these reviews are really fair since they are people just rushing the installation process. The first time I installed a Zagg protector on an iPhone I rushed it and ended up with a bubble on the back from a few dust particles, it was annoying but who am I to blame but myself? Follow the instructions and take it slow, you’ll be pleased. The pictures you see of iPad’s are from a Mobile Me gallery by Brandon Steili who has the ScreenGuardz HD and probably used a real digital camera to snap the pictures, which look significantly better and more accurate than anything I could replicate with my iPhone 3GS’s camera. Below you’ll see his pictures of before and after with the ScreenGuardz. As previously mentioned, it doesn’t 100% remove glare it just reduces it and makes it much more tolerable – particularly in outdoor conditions. Can you comment on if the Speck antiglare film has the “prism” effect? I’ve been using the anti-glare product from Incipio ever since I got my iPad and really do like the fingerprint and glare benefit, but I’m growing annoyed at the crystalline-prism effect (most noticeable on white pages) – especially after using the awesome iPhone 4 display. I realize any anti-glare protector has some downsides. Just curious if this is noticeable with the Speck. I have a protective cover on my iPad and I don’t notice any prism but it does dull the color just slightly. I think it’s a worthwhile investment, getting rid of the smudges alone makes a big difference and doesn’t feel so gross when you hand it to someone else to use. Thank you very much for this post. There are so many products out there, its really difficult to decide which one to pick.